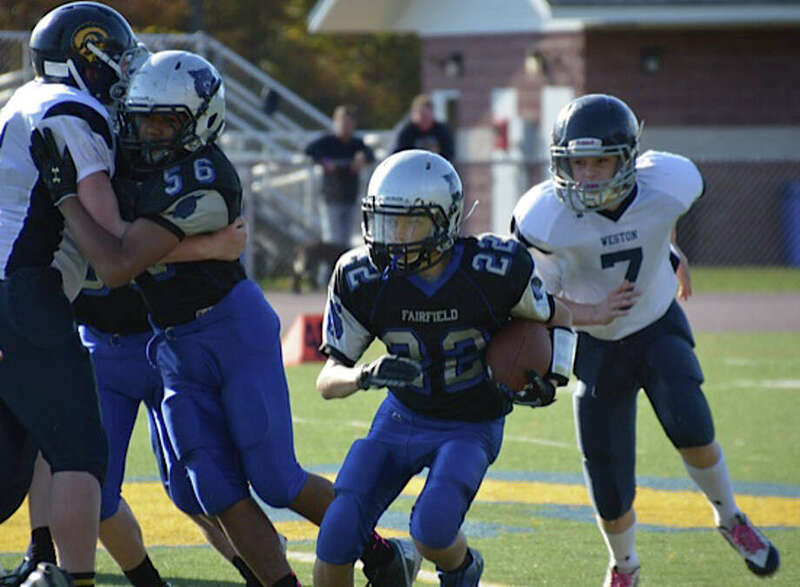 Fairfield Wildcats' eighth-grade running back Timmy Jacobi runs through the Weston defense last weekend. The Fairfield Wildcats' eighth-grade team scored first and never looked back as it marched to an 18-6 win over Weston on Oct. 20. Zach Taylor got Fairfield on the board with a fumble recovery and run for a touchdown for a 6-0 first-quarter lead. A few minutes later, Jack Curtis's impressive run set up Clay Zachery for a strong carry into the end zone. The Wildcats ended the half with a 12-0 lead. In the third quarter, Fairfield receiver Cam Pickering was interfered with to gve the Wildcats great field position. Timmy Jacobi capitalized with the final Wildcats' touchdown, a 15-yard carry. The Wildcats defense led by Wil Parisi, Kris Gjinaj, Chris Nielsen, Zachery, John Blumenthal, Tyler Festa, and Conor Ginley. Matt Coda, Sam Hawley, Hunter Marson, RJ Salerno and Jack Hogarth contributed offensively. The eighth-graders take on Wilton at home Saturday at 1:30 p.m. at Ludlowe High. The sixith-grade Wildcats dropped their final home game to Weston 27-13 on Oct. 19. The offensive line of Jason Conklin, Tristam Breheny, Joe Faletta, Ryan Janz, Massimo Perillo and Liam Hawley helped allow the team to rush for more than 100 yards. The Wildcat touchdowns came on a pass from quarterback Joey Gulbin to Conner O'Neill, on the team's opening drive, and a 20-yard run from tailback Evan Rose on the game's final play. Fairfield Black rallied for a 27-14 victory last weekend after Ridgefield scored on a 40-yard run on the first play. Ridgefield scored one more time before but the extra-point missed, keeping the score 14-0 in the first quarter. The Fairfield defense created plenty of pressure led by linemen Danny Haidar, Charlie Mitola and Max Aderholt-Koon. The Wildcats' secondary -- Kieran Heske , Ryan Voytas Logan Marson, Kevin Howard and Cole Curtin -- was equally effective over the remainder of the game. Jack Reiling scored after connecting with Harrison Keith on a 45-yard passing play. Reiling converted the extra point. Karl Schmidt connected with tight end Paul Sussman for a catch to set up a touchdown by Keith. Andre Mead finished the scoring with a pick-6, and Patrick Covino scored on the conversion. Wildcats will play host to New Canaan Black on Saturday at 3 p.m. at Ludlowe.